In the whole of English history, there has only been one man who dared to rebel against the king, seduce the queen, and then depose and murder that same king and rule as regent. That man was Roger Mortimer, and he was kind of a badass. Roger has been immortalized in chronicles and plays as the nobleman who rebelled against King Edward II, lived openly in an adulterous affair with Edward's queen, Isabella, with whom he raised an army and marched against the king, deposing and later murdering him. He assumed power under the name of the new, underage king, Edward III, and soon became so tyrannical and arrogant that he himself was captured and murdered by order of the new king in 1330. Ian Mortimer brings this shadowy character to life in The Greatest Traitor, the first full-length biography of Roger, and seeks to understand the motivations behind Roger's actions in the 1320's and the personality he must have had to do what he did. This is a historic figure who has been villainized and condemned for 700 years as pretty much the worst person who ever lived, but in his book Ian Mortimer applies his usual attention to detail and brilliant analytical mind to finally tease out the humanity of the man behind the myth. Although there are not a lot of surviving sources and facts about Roger's life, Mortimer has put together all the existing information in a highly entertaining and readable biography that is more exciting than most novels I've read. The most surprising thing to me was learning that Roger was incredibly loyal to King Edward II for most of his life, and that he was basically forced into rebellion due to the king's illegal and disturbing actions concerning his corrupt favorite, Hugh Despenser (who may also have been his lover). As I read about the circumstances that led Roger to rebel against Despenser, I felt bad for the guy and felt like I probably would have done the same thing if I were in his place. Well, I probably wouldn't have killed 10,000 of Despenser's sheep. That was just unnecessary. After he was caught he was imprisoned in the Tower of London, and all his lands and goods were seized by the king. They even took his wife's books...I would have joined the rebellion myself! 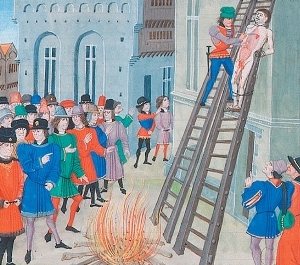 Hugh Despenser's gruesome execution, from Froissart's Chronicles. Queen Isabella had her own reasons to turn against her husband. He gave most of the jewels and gold they received as wedding gifts to his first favorite, Piers Gaveston, and was often seen kissing Gaveston as he shockingly sat in Isabella's throne. Despenser was even worse. While on campaign at the Scottish border, the king got word of a surprise attack coming from the Scots. He took Despenser and they fled back into England, leaving Isabella alone to face the angry Scottish army. She managed to escape on her own before being captured, but man, chivalry has never been so dead. From that point on Isabella worked to help Roger escape from the Tower of London and assist in the rebellion, and they entered into an adulterous affair with each other. That made it rather awkward when Roger had to introduce his wife, who was alive the whole time. Mortimer discusses this with professionalism and humor, detailing how Roger built a separate lodging within his castle so Isabella and his wife wouldn't have to live under the same roof. What a gentleman. Mortimer's writing, as always, is visceral and immediate, making me feel almost like I was watching this fascinating and often unbelievable tale as it happened. He recounts Roger's escape into France, his collusion with Isabella and the French king, the army they marched into England, Edward II's capture, imprisonment, and supposed murder. He describes the horrific execution of Hugh Despenser, which I have to share just because it's so outrageously harsh. Despenser was stripped naked and an angry mob wrote accusatory biblical verses on his skin. Then he was tied to four horses and dragged through the city to his own castle, where there was a special gallows created just for him with a bonfire burning at the base. He was hung by the neck 50 feet up in the air, and then lowered onto a ladder while still alive. He had things cut off with a knife, things which most men would want to die before seeing cut off, and which afterward calls the word 'man' into question. Then his heart and entrails were cut out and burned, his head was cut off, and he was chopped into several pieces that were then sent all around the kingdom. Those were really the days not to get on the wrong side of the law! Mortimer continues on to describe Roger's changing attitude as he ruled through the young king, how everything went so wrong, and why he became so hated. My heart was literally pounding as I read about Edward III's plot to seize power and depose Roger, which included enough sneaking around in secret subterranean castle passageways to thrill even those perplexing people who are uninterested in history. Mortimer also proposes some theories that drastically change the history as we think we know it, and supports these theories very convincingly with evidence. One of these is his theory that Edward II was not murdered after all (allegedly by having a red hot metal spike shoved up through his back door into his intestines, just in case you wanted to have a lovely image in your head) but was secretly smuggled abroad and left alive. At first I thought this just a crazy conspiracy theory, but Mortimer does present a good deal of circumstantial evidence that makes me desperately wonder if it could be possible. He rightly calls his theories mere suppositions, as they cannot be proven, but his approach is scholarly and sensible and he makes some electrifying guesses to what may have been going on behind the scenes. Overall, The Greatest Traitor is an exciting and thorough biography of a much-hated and little-known man that deserves the highest praise for its in-depth research, its open-mindedness, and its immense readability. I don't necessarily think that Roger was a great guy, but after reading this book I do feel like I can understand his actions a little better, and see him in the context of the significant changes taking place within the English monarchy and how it was perceived. 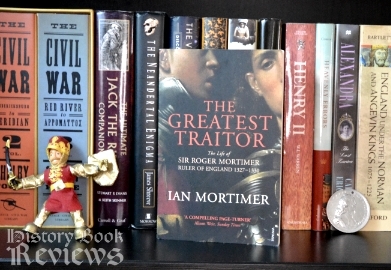 Ian Mortimer proves himself once again as one of my favorite history authors of all time, with his well-rounded approach bringing vivid life to yet another of history's elusive and controversial characters.